I also ran into this flag today, you can see in in the background on a pole. It appears to be a logo on white, you can see a red "e" I tried some searching to figure out what it was and I had no luck. 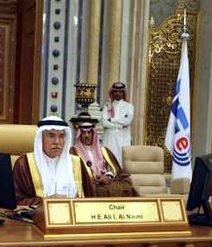 I am 95% certain that the chairman of this meeting (according to the name plate) is Ali al-Nuaimi who is Saudi Arabia's Minister of Oil and Mineral Resources. I don't know if this is special OPEC or OAPEC flag or something else. The Photo had no caption, but appeared next to a link for a story about OPEC pumping more oil in the wake of recent price increases due to conflict in Libya. The signature by 86 countries of the International Energy Forum (IEF) Charter took place yesterday, 22 February 2011, in Riyadh, along the Extraordinary IEF Ministerial Meeting. It is the concretisation of the process started in March 2010 at the 12th IEF Ministerial Meeting, the so-called Cancun Ministerial Declaration that was endorsed by 66 countries. The Cancun Ministerial Declaration was mainly addressing two issues: the enhancement of the IEF framework to reinforce the producer-consumer dialogue, and the manner to reduce energy market volatility. The IEF Charter is the embodiment of the IEF framework called upon in the Cancun Ministerial Declaration. Energy market volatility is addressed within the IEA/IEF/OPEC cooperation programme, also referred to in the Cancun Ministerial Declaration. Among the activities of the cooperation programme count the organisation of joint events on physical and financial energy markets linkages that include energy market regulation, energy outlooks exercises, and market data transparency. The International Energy Forum (IEF) is the world's largest gathering of Energy Ministers. IEF Countries account for more than 90% of global oil and gas supply and demand. In addition to IEA and OPEC countries, transit states and key energy players, including Brazil, China, India, Mexico, Russia and South Africa, participate in the Forum. The magnitude and diversity of this engagement is a testament to the IEF's position as a neutral facilitator. Through the Forum and its associated events, IEF Ministers, their officials, energy industry executives, and other experts engage in a dialogue of increasing importance to global energy security. The IEF and the global energy dialogue are promoted by a permanent Secretariat of international staff based in the Diplomatic Quarter of Riyadh, Saudi Arabia. The IEF flag is white with its logo.